(CBS News) A 6-year-old boy is battling against a bite from one of the deadliest snakes in the country, the Mojave Green. According to CBS Los Angeles, Kaden Rivera was enjoying a holiday camping trip on July 4 when disaster struck. "My son was chasing the dog. All of a sudden we heard a scream from out of the bushes. 'I've been bit by a snake,'" the boy's father Ken told the station. Rivera saw signs warning of rattlesnakes, and ran with his son to the ranger's station while his condition worsened. By the time they reached the ranger, the boy was already vomiting and foaming at the mouth. "He lost control of his muscles, and his limbs. He had a rash all over his face. He couldn't breathe," the boy's father said. 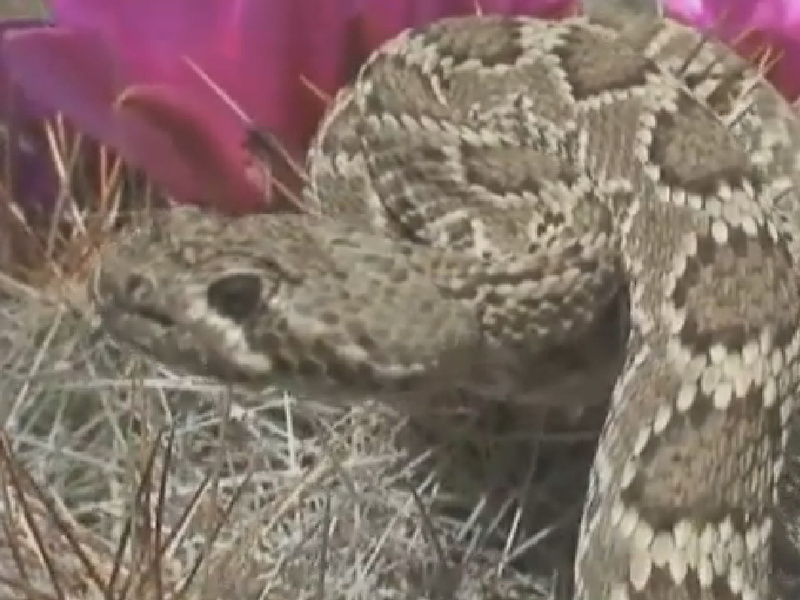 He was brought to Mission Viejo Hospital in Mission Viejo, Calif., where doctors recognized the symptoms as a bite from the especially toxic rattlesnake, the Mojave Green. "It took 42 vials of antivenom just to stabilize him," the boy's father told CBS Los Angeles. "Normally it would just take a few ... depending on the snake." Representatives at Mission Viejo hospital said they could not comment on the child's case. Bush said when a poisonous Mojave bites, the venom can stay in a person's system for weeks or months. About 15 percent of people bitten by a poisonous snake may lose a body part like a finger, or experience loss of sensation or function. Others may experience more severe complications like bleeding to death from one bite from the deadly snake. While 42 vials of antivenom, or antivenin, may sound like a lot, Bush said some cases he's treated have required 58 vials or continuous drips of antivenin that may approach 100 vials of the treatment. Typical treatment is using CroFab antivenin, which is a type of antivenom made from four snakes that can treat poisonous bites from North American pit vipers. Bush sees snakebites commonly at his hospital, especially among kids, who he calls "high-risk" because they are little and are more likely to run around outdoors without shoes when it's warm out. Bush's son himself was bitten by a rattlesnake when the child was 2, and was profiled in the New York Times, so he knows firsthand how frightening this can be when a child is struck by a snake. Luckily, he said, "Kids are amazingly resilient" when it comes to snake bites. Out of tens of thousands of children who have suffered poisonous snake bites over the past decade, Bush estimates only three have died. By giving antivenom earlier and in higher quantities, it may protect from worsened outcomes, he said. If you live in an area with poisonous snakes, Bush urges parents to make sure their children are wearing footwear or even denim jeans while outdoors, which can reduce the odds of a bite. Most importantly, kids should stay away if they see a snake. "A lot of young kids, they get bitten when they harass the snake," Bush said. He added that many bites occur when a child tries to play with a snake, or thinks a snake is dead and picks it up, only to get bitten. Even severed snakes could still stay alive for more than an hour and give a deadly bite. "This is actually the peak time of year for snake bites," Bush said, adding that the heat and moisture provide an ideal environment for snakes. "People [also] go out a lot, and when the snakes move and the people move, that's when they get together and connect in a bad way." Dr. Bush has more information on toxic snake bites.